Yarmouth Cares About Neighbors is an independent not-for-profit 501(c)(3) organization run by citizen volunteers. YCAN works to strengthen the Yarmouth, Maine community and meet community needs by connecting available resources with the people who need them. The organization was founded in late 2008 by concerned citizens in Yarmouth, Maine, with Julia Martin as its founding President. Its mission is to create a sustainable community organization that promotes the connection of resources with people who need them. Compiling a directory of available resources, and providing information about the availability of organizations that provide social services and assisting in meeting other human needs. Providing a forum to identify and assess needs. Providing a forum for providers of social services to meet and coordinate efforts. Identifying segments of the community who have needs that are not being met by existing services. Facilitating the development of programs designed to address identified needs. Assisting individuals in contacting organizations that may be able to provide needed services. Coordinating the provision of services or assistance and, where appropriate, by directly providing services or assistance to community members in need. Providing volunteer opportunities for community members to support and participate in activities to benefit the Yarmouth Community and its members. Helping to raise funds as needed for programs that are meeting community needs. 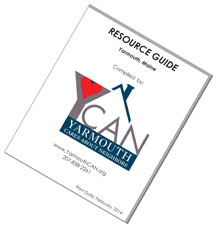 YCAN publishes and updates its Resource Guide. A YCAN telephone number provides referrals for those seeking assistance. Yarmouth Cares Fund (formerly called the Fuel Fund) has raised over $25,000 annually to help Yarmouth residents in need. Assistance can include heating, winterization, food, clothing, and transportation. YCAN helped fund some additional fuel to help 38 households in need stay warm during 2015. YCAN organized a forum for service organizations in the smaller towns surrounding Portland, allowing groups to share ideas and experiences with one another about how we can best meet the needs of our residents. YCAN has organized periodic Community Meetings to solicit raise awareness of the needs within our community and solicit ideas for ways to meet them. Several community food pantries merged to create The Yarmouth Community Food Pantry, which YCAN supports with publicity, fundraising, and accounting services. The Food Pantry served 190 people from 70 Yarmouth families during 2015. Nutrition Closet is a supplemental food program for students with unstable access to weekend food while school is in session. YCAN provides financial support to this program, which is organized and run by Yarmouth School Department staff and students, and which will include all four schools during 2015-2016. Lunch Crunch provides free summer lunches to low income children in Yarmouth to help ensure they receive adequate nutrition while school is not in session. YCAN provides financial support to this program, which is organized by Yarmouth Community Services. It provided 1,639 free meals for children aged 2-18 during 2015. Project Holiday helps families in need provide holiday gifts and food for their children, with YCAN providing some publicity and funding for an annual collaboration between many Yarmouth organizations. It provided gifts for 109 children and food for 292 children and adults in 2014. Operation Bundle-Up collects outgrown winter outerwear, cleans it, and distributes it to local families in need, with YCAN providing publicity and coordination. During 2014-2105, it provided 55 winter coats to nearly two dozen Yarmouth families. The Rides Program coordinates volunteer drivers to help those who cannot drive get to local shopping areas or medical appointments, with YCAN providing publicity and support. During 2016, 25 volunteers supported other Yarmouth residents by providing them with 705 hours of driving time. The Yarmouth Community Garden applied for and received a grant, with YCAN serving as the 501(c)(3) umbrella organization for the funding. YCAN is always seeking new or future Board members. Please contact us if you are interested in joining!